Who Is Behind K.G.M. Crafts? I (Grace, the teenybopper) went to Mom and said, "I want to do something with my life! To get a job! But I can't drive the car yet. Town is miles away! What can I do?" Mom had this wonderful idea! "What do you think about starting a website with me? It will take a lot of commitment and work. So we need to choose something that we are passionate about." Figuring out what to do proved to be harder than I thought. "What am I good at? What do I like to do?" I first thought about the books I like to write for teenagers. Imagine! 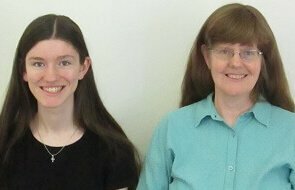 A mother and daughter doing a website on Christian, sci-fi, dystopian, and life on Mars , uh, Earth. Hmmm, now that I think about it, that's not really Mom's thing. She does like to read my books and watch an occasional sci-fi movie. But, when I start talking about the newest tech, her eyes glaze over. So that is out. Then Mom started talking about crafts. Not just any type of crafts but kids crafts. I thought this might work. I like making messes, umm I mean make things, out of paper and glue. Oh don't forget the glitter. So we checked the numbers on this cool tool at Solo Build It! called Brainstorm It!. According to the numbers kids crafts is something you would like to know about. We have a habit of working in our PJs, making jokes, and of course eating brownies with ice cream on top. But putting all joking aside there is a lot of teamwork. Sometimes the crafts are not "picture perfect." For example, I made an alien paper chain once. Mom wouldn't let me keep it. It happens. Maybe some day I can get Mom to let me show you our "masterpieces." As you might have guessed while reading this, I help by adding interesting tidbits on each page. Mom is the head of the organization. She is on social media, so don't be afraid to say hello! Mom also resizes all the hundreds of pictures that we take on a weekly bases. She also uploads the page. Well, you don't need a degree to be creative. But, sometimes education is nice. So I will toot my horn a little bit. I (Karen) have a BA in psychology. I didn't do much with it except get married and then homeschooled my children. Where we did a lot of hands-on-learning and crafting. After that I decided that I wanted to work in the school district, So, I took two years of para-education classes. I did work in the field for five years mainly with autistic children. So why did we name it K.G.M. Crafts? We wanted something short and to the point. We looked and looked. Everything that we could think of was taken or too long. So we thought about our initials. Mom's name is Karen and mine is Grace. That explains the first two letters in K.G.M. Crafts. We added the M for our last name. Then we added the word "Crafts" because that is what we do. Enough about us. 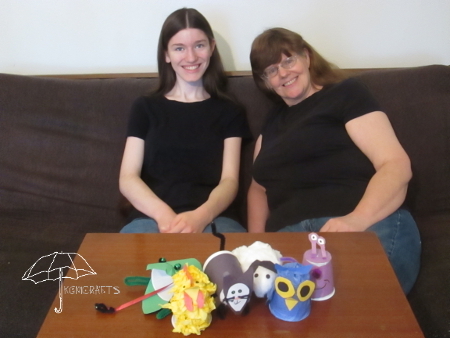 It is time for us to go have some fun making messes kids crafts to share with you. Then you can have fun creating with your kids. Need to contact me? Please use this link.